Playlisted on Armin van Buuren and Above & Beyond radio shows. 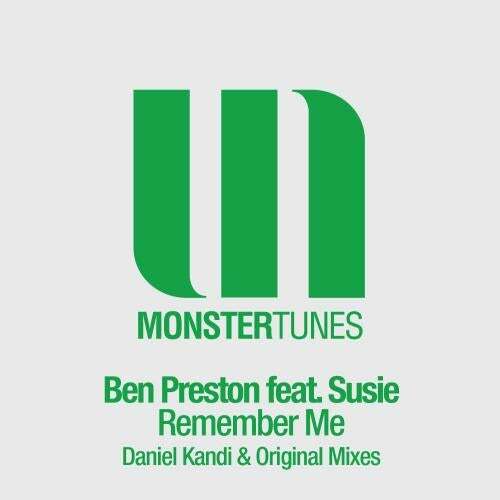 For his debut release on Monster Tunes we welcome Ben Preston, a big rising star on the trance scene at the moment. Ben has been receiving massive support from all the major DJ's such as Tiesto, Armin van Buuren and Above & Beyond with his tracks being release on Blackhole Recordings, High Contrast, Spinnin', Garuda and Armada. Ben has been a very busy man with his productions of late and this outing is a huge dancefloor anthem with 'Remember Me' featuring the talented vocalist Susie Ledge. This really is a fine piece of music and we're sure you'll agree with us on this one, with massive euphoric melodies, anthemic riffs that have hints of Chicane and the beautiful vocals from Susie, it just catches your attention immediately and will surely be one for the summer months! Up for the remix treatment we have been pleased to receive a fantastic transformation by none other than Danish maestro Daniel Kandi. Delivering an absolutely smashing remix that clearly shows off Daniels versatility and passion for all styles of trance with this diverse sound from his normal productions. All in all this is a summer anthem on both accounts and we will hope to see you all rocking it out on the dancefloors to this one! !